Custer State Park, adjacent to the county seat of Custer and in the county of Custer. attests to the impact on this area of Gen. Custer. In the mid nineteenth century the Black Hills belonged to the Sioux and Cheyenne tribes as confirmed by the Fort Laramie Treaty of 1868. This treaty granted this 4500 sq. mile area with the Black Hills as the western border to the Indians. However in 1874, Generals Sherman and Sheridan ordered Lt. Col. Custer on two month expedition to explore the area and establish an army post. 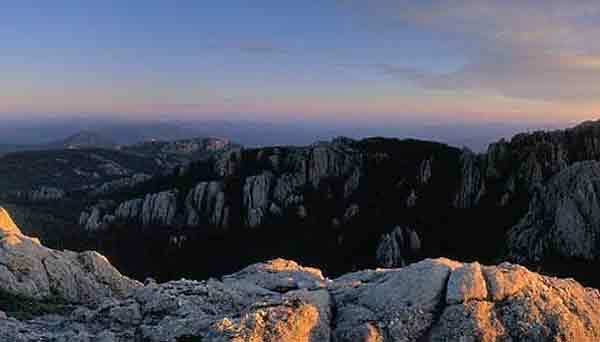 The 1000 man expedition confirmed the presence of gold in the black hills. Larry McMurtry says in contrast to Custer's shortcomings as a military tactician, he was unexcelled as a land salesman. Inside of two years there were an estimated 15,000 miners in the Black Hills area. Homestakes Mining company would eventually take 1.5 billion dollars in gold from this area. To resolve the conflict between the miners and the tribes, the Sioux and Cheyennes were ordered to move onto reservations west of this area in the winter of 1876. This led to the Battle of the Little Big Horn in the summer of 1876. The southern and largest portion of the park is situated on a plain and contains a 20 mile circular drive which is noted for its wildlife. In this area are buffalo herd (1500 buffalo), pronghorn sheep, white tailed deer, elk and feral burros. The burros are the descendants of burros used to transport tourists to top of Harney Peak. The northern portion of the park is accessed via Needles Highway, constructed in 1919 winding through tunnels and alongside rock spires. Bighorn sheep, mountain goats, and mountain lions inhabit this northern portion. Sylvan Lake is located in northern part of the park. This large park contains 71,000 acres including four resorts. Two presidents have vacationed atCuster State Park. Calvin Coolidge made the State Game Lodge at Custer his "Summer White House" in 1927. President Eisenhower visited the State Game Lodge in 1953.